WIFDN supports a variety of volunteer opportunities to fit your needs. Read about current opportunities below and stay tuned for new opportunities! Resource managers and researchers rely on citizen scientists across the state to report invasive species. 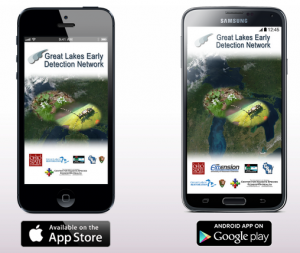 Use the free Great Lakes Early Detection Network app to easily map invasive species and submit your reports to WIFDN! It takes less than a minute to create a report, so this opportunity fits into any schedule, any season. Learn how to use the GLEDN app in this guide, or watch a training video here. Not sure what to look for in your area? Click on your county in this story map to get a list of priority plant species to report for your county. Looking for more ideas on what to report? Try the GLEDN Monthly Challenge! Download the GLEDN app today! Look for and report aquatic invasive ornamental plants that have escaped or been released into local ponds. Head to the Pond Watchers page to learn more! 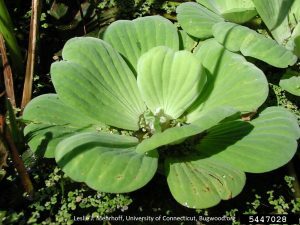 Water lettuce is a Pond Watchers target species. Palmer amaranth and waterhemp are problematic pigweed species, especially in our agricultural lands. Look for and report these species. Learn more at the Report a Pigweed page! Help survey for emerald ash borer (EAB) and its relatives by walking your local baseball field! You might be wondering how you’d find EAB in a field that clearly has no ash trees. One of Wisconsin’s native, stingless wasps, Cerceris fumipennis, provisions its nests with metallic wood boring beetles like EAB. And, you guessed it, the wasps nest in sandy areas, like baseball fields. The survey runs from July – September each year. You can do as little as scout a local field once or as much as visiting active nests once per week. Learn more about the survey from this video. 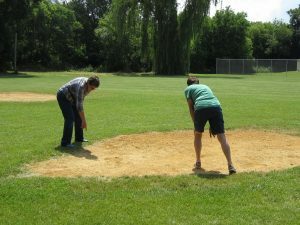 Survey volunteers identify Cerceris nests in a baseball field. AIS Snapshot Day- Save the Date for 2019! Join the River Alliance of Wisconsin and UW Extension for a one day, statewide survey of aquatic invasive species in our rivers and lakes. The day will start with training at each of the several rendezvous sites (no prior training required! ), then groups will work together to survey several monitoring sites.